Stockinette stitch is a basic knitting stitch. To knit stockinette stitch (abbreviated St st), you alternate a knit row with a purl row. Stockinette stitch (or stocking stitch) is everywhere: scarves, socks, sweaters, blankets, hats — you name it. Stockinette stitch has a right and a wrong side (though, of course, either side may be the “right” side, depending on the intended design). The right side is typically the smooth side, called stockinette or knit. On this side, the stitches look like small Vs. 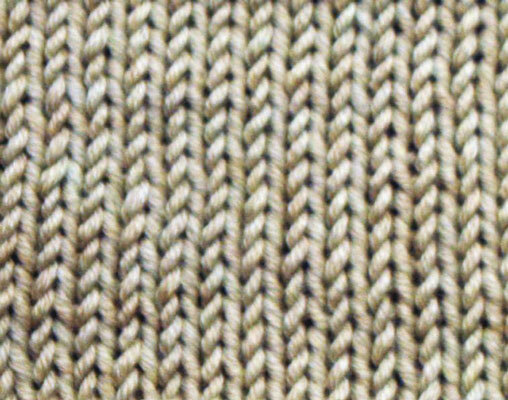 The bumpy side of stockinette stitch fabric is called reverse stockinette or purl. Stockinette fabric curls on the edges. 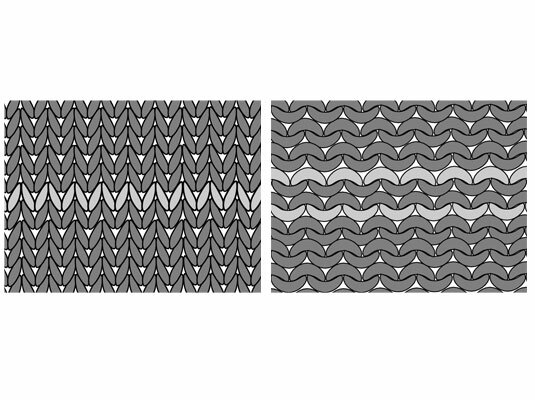 The top and bottom (horizontal) edges curl toward the front or smooth side. The side (vertical) edges roll toward the bumpy side. Sweater designers frequently use this rolling feature deliberately to create rolled hems or cuffs, and you can create easy cords or straps simply by knitting a very narrow (say, 4 or 6 stitches across) band in stockinette stitch. When you want the piece to lie flat, you need to counteract this tendency by working the 3 or 4 stitches on the edge in some stitch that lies flat (such as garter stitch or seed stitch). If you’re working in stockinette stitch and you lose track of whether you knit the last row or purled it, look at your knitting. Hold your needles in the ready-to-knit position (with the LH needle holding the stitches to be worked) and look at what’s facing you. If you’re looking at the knit (smooth) side, you knit. If you’re looking at the purl (bumpy) side, you purl.